Windows 10 keeps track of Apps that you launch, the websites that you browse and sends this information to Microsoft. 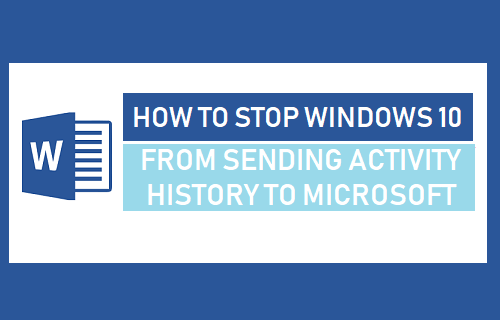 You will find below steps to prevent Windows 10 from sending Activity history to Microsoft. Microsoft is transparent about Data Collection feature in Windows 10 (as it should be) and provides an option to View, Clear and disable Activity History via “Privacy” settings on your computer. However, many users were surprised to find their Activity History still being collected, even after disabling the option in Privacy Settings. 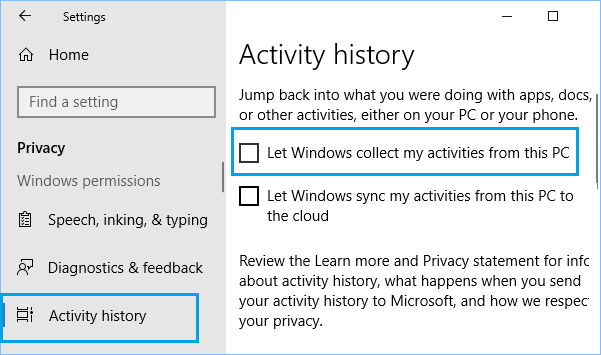 This problem was recently discussed on Reddit, and you can confirm whether the problem still exists by going to Settings > Privacy > Activity History and disabling “Let Windows Collect my activities from this PC”. After disabling collection of activity history, scroll down and click on the Privacy Dashboard link. This will take you to Microsoft’s Privacy Dashboard page, where you may be prompted to login to your Microsoft Account. Once you are logged-in, click on Privacy > Activity History and you will still be able to see List of Apps that you have launched on your computer. Hence, we are providing below the steps to disable other settings on the Privacy screen, in order to totally Stop Windows 10 from sending your Activity History to Microsoft. 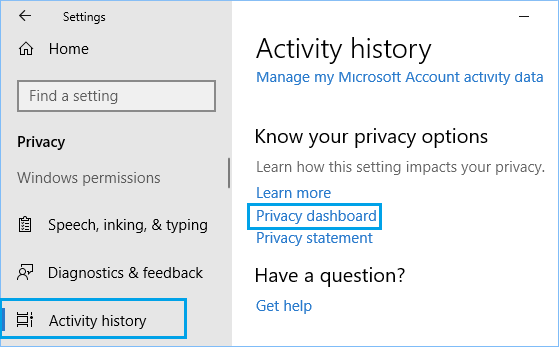 A possible reason for Windows 10 sending activity History to Microsoft, even after disabling the option in Privacy Settings could be due to sending of activity data being enabled in “Feedback & Diagnostics” option. 1. Click on the Start Button > Settings Icon. 3. On the Privacy screen, click on Feedback & Diagnostics in the side menu and select the Basic option. Selecting the “Basic” option does not send information about Apps and Programs that you open on your computer to Microsoft. It only sends some basic data necessary to keep Windows up to date on your computer. 4. 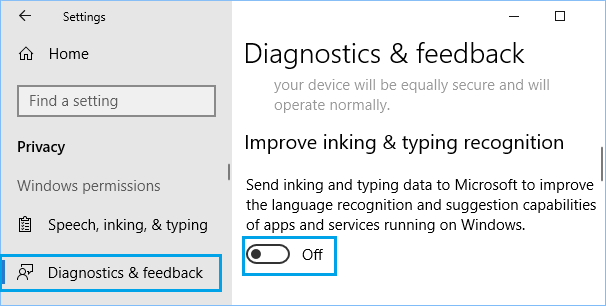 Next, go to Settings > Privacy > Diagnostics & Feedback and turn OFF the option to Send inking and typing data to Microsoft. 5. Go to Settings > Privacy > Activity History and Turn OFF “Let Windows collect my activities from this PC” option. 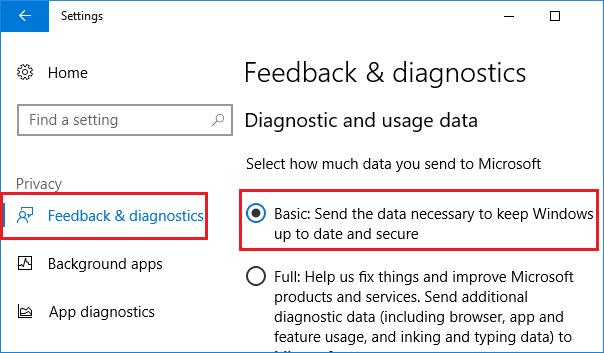 In case you are still concerned, you can change registry settings to totally disable Telemetry and data collection on your Windows 10 computer.